Purple Daze [Book Review] – my books. my life. Cherly, Mickey, Ziggy, Nancy, Don, and Phil are teenagers living in Los Angeles in the tumultuous year of 1965. Assassinations, war, and riots invade their already complicated lives. 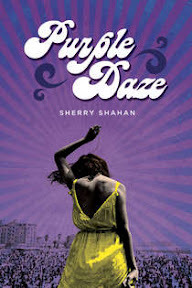 Told through verse, letters, and actual historical excepts, Purple Daze offers an inside look into life in the 1960s. Purple Daze was the perfect Readathon book. It reads quickly (it can easily be read in a couple of hours) and every page is fascinating. Vietnam, the Civil Rights Movement, the LA Riots, and so much more is going on. Phil is drafted and sent to Vietnam. His letters home to Cheryl paint a picture of the war. At the same time, the rest of them are dealing with normal teenage problems – relationships, alcohol and drugs, and parents. Because the story is told through the poems and letters of the characters, it is easy to really feel what all of the characters are experiencing. The book seems real. The book is based on Shahan’s own experience and letters she found from a friend in Vietnam. The actual excerpts of news articles and speeches enhance the book. It would be a great tool to teach teenagers what life was like then (hide the learning in the awesome book, right?). Once again, I am impressed with the ability of novels in verse to pack so much into so little. I can definitely recommend Purple Daze to anyone who wants to glimpse life as a teenager in 1965. I have actually never read a book in verse before, but this one sounds like it might be something I would like. Thanks for sharing this great review with us! I’ve read a couple books in free verse and they just ROCKED. That style is so impactful. I just read a middle reader book called Jack & Me that revolves around the Vietnam War, from the perspective of a 12 year old in Pennsylvania, whose dad is an Army recruiter. It is a great perspective…lots of angst and drama. Have you tried any of Lisa Schroeder’s books? CHASING BROOKLYN was excellent. And so is her newest book out in June. I don’t always do well with books in verse, but I love the social history aspect to this one. I may have to check it out. I wish I enjoyed books in verse, this one sounds like it would be a good read. I just can’t seem to connect with that style (as beautiful as it seems).